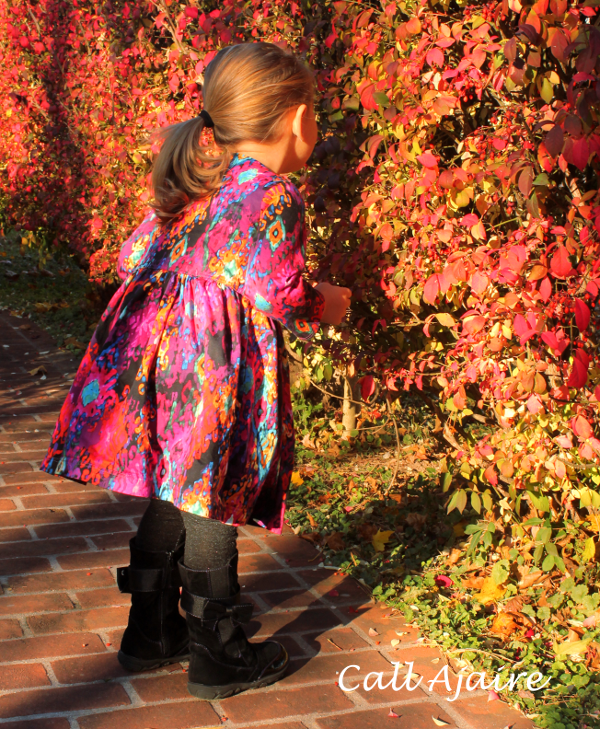 I’m so excited to finally share Bean’s favorite fall dress with you! 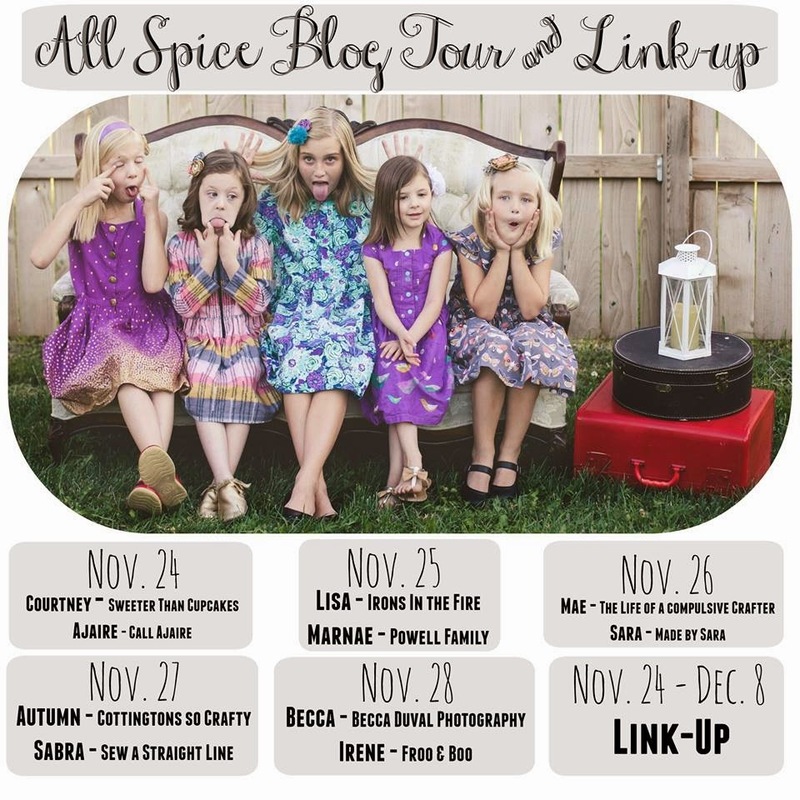 The Allspice Dress pattern by Paisley Roots is on tour this week along with a giveaway and a link up so let’s kick off the tour in style. This summer I was a tester for the Allspice and I immediately fell in love. There are four sleeve options: flutter, cap, sleeveless, and my current favorite the long sleeve. 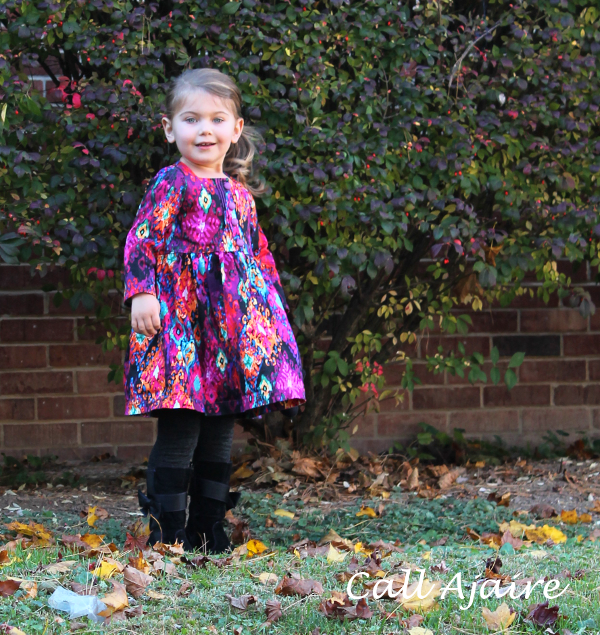 This dress is perfect for the cooler weather we’ve had this fall. The fabric I used for this version is a stretch sateen from JoAnn and Bean calls it her “spooooooooky dress.” It’s probably the most complimented dress that she wears. The colors are striking and though it may be hard to see in these pics, the pin tucks on both sides of the button placket are just the right detail for such a busy fabric. The bodice has the option of a button or zippered front placket and I made a zippered version as well. I love that polka dot fabric, but Bean decided to have two huge growth spurts in a row right after I made this dress so it no longer fits. The stand out zipper is really fun though. I also made a sleeveless version in size 6-12M for my friends’ little girl. I like the sleeveless option so it can be used with layers in the cold weather and alone when it warms up. 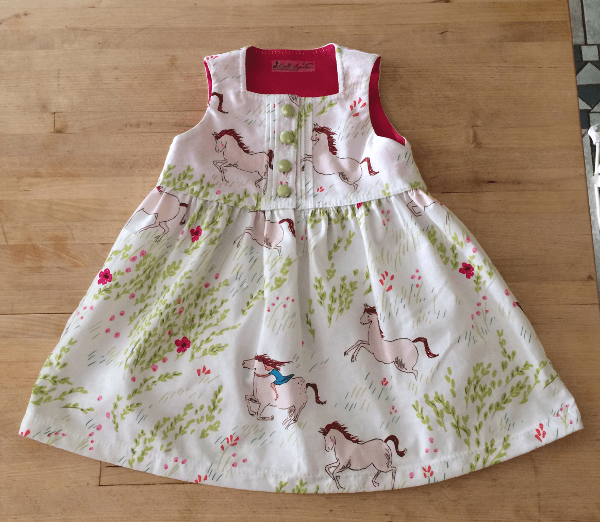 You may remember that I made Bean’s Saffron Twirl (pattern also by Paisley Roots) birthday dress out of this Wee Wander fabric too. I had a bit left and it just had to be an Allspice. And yet another 6-12M sleeveless Allspice for one of my husband’s co workers who had their first baby earlier this fall. I didn’t get a great picture of that one so the picture above is the best I have, hehe. I do love those polka dots and the snaps are just the right shade of purple too! 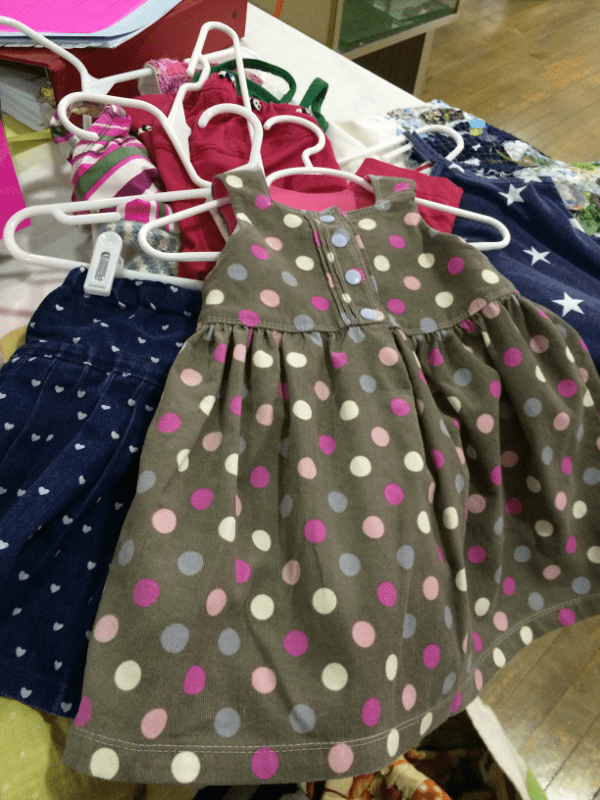 The pattern comes in sizes 6-12M through 12. The two baby sizes I’ve already mentioned, but the polka dot one I made for Bean is a 3T and the “spooky” dress is a size 4T. 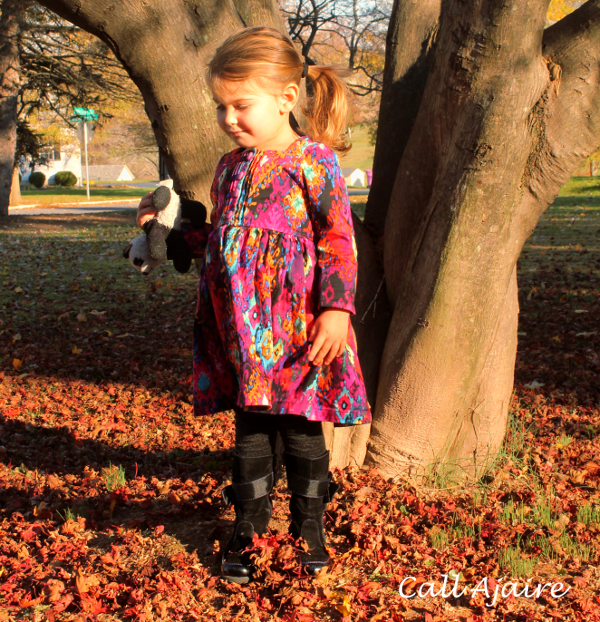 You can purchase the Allspice Dress pattern at 25% off through Sunday using the code BLACKFRIDAY. The square neckline is another detail that I just adore. And look at the billowy shape of the skirt. I can’t wait to see all of your Allspice Dresses. Enter the Rafflecopter giveaway and link up your dresses below! So many cute versions!! I love the bright colors of the latest one! Eep. So cute! Ansley just drew out a dreaa she wants me to make and it's surprisingly difficult to find long sleeved dress patterns. This would be perfect. Thanks Courtney! It's the perfect baby shower dress pattern. And yes we adore that fabric! These are really nice comfy sleeves too Emily. Even with the stiffer corduroy they aren't tight or uncomfortable. I love how they look too. Gaw you are so productive. You must assembly line everything!! Love them ALL- what a cute pattern.